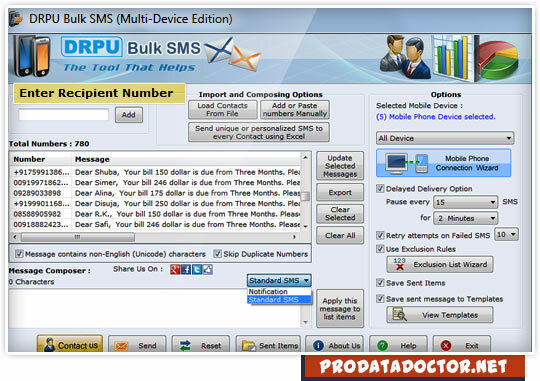 Bulk SMS software (Multi Device Edition) is useful program to send unlimited text messages simultaneously from computer to list of contact numbers using GSM mobile phone. SMS gateway program allows you to connect multiple numbers of GSM mobile phones to your computer for sending group text messages across the world. Retail Business, Banking industry, SEO Companies, Healthcare sector, Government organizations, IT companies, MLM Companies and other commercial sectors. ✔ Send unlimited text messages instantly: Group SMS software sends broadcast business campaigns, greetings, news alerts, reminders and other personalized SMS instantly from your computer system to numbers of mobile users using GSM mobile. ✔ Deliver notifications and standard SMS over global mobile network: SMS broadcasting program provides option to send notifications and standard messages over worldwide location. ✔ Connect multiple numbers of GSM mobiles to your PC: Mobile marketing solution provides facility to attach multiple numbers of GSM mobiles to your computer system for sending group text messages. ✔ Send text messages in different languages: GSM mobile messaging program supports all Unicode characters for sending unlimited text messages in different languages. ✔ No internet connection is requires for sending bulk SMS: Mobile messaging software forwards group text messages to your global mobile audiences without needing any internet connection.